Q. Why is the compulsory dog chipping being proposed in the UK? Compulsory chipping is being offered as a solution to a number of problems: lost/stray dogs, dangerous dogs and irresponsible ownership. Upon closer scrutiny none of these claims make sense. Q. Who is in favour of the compulsory dog chipping proposals? All of the main political parties have expressed support for a chipping law. The idea is being promoted by a number of animal charities including the Royal Society for the Prevention of Cruelty to Animals (RSPCA) and the Dogs Trust. There is also widespread support from a number of corporations that would make a lot of money from a compulsory chipping law. Q. What is wrong with compulsory chipping? There are a number of problems with chipping dogs, from health concerns to the fact that it simply will not solve the problems that proponents say it will. 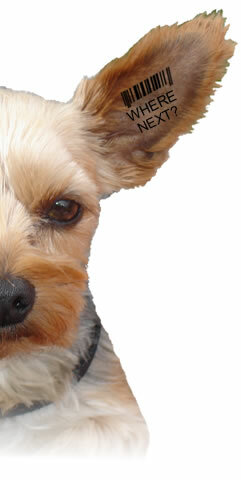 Many of these issues are spelt out in our Dog Manifesto as well as our 'What's Wrong?' page. Q. Shouldn't I be able to choose whether to chip my dog? Yes, absolutely. It should be up to each owner to weigh up the pros and cons of dog chipping and make their own decision. That is what responsible ownership is about. Q. How many animals have received microchip implants in the UK? In the UK since 1997 the Dogs Trust say they have micro-chipped over 230,000 dogs. The consultation document that accompanies the current government Consultation on Dangerous Dogs states that: "Since being introduced in 1989, over 4 million dogs and cats have been microchipped. There are an estimated 8,000 registrations every week." Petlog is the UK's largest database of pets and owners - it is operated by the Kennel Club. The document also states that: "In 2009, Petlog registered over 512,000 pets." Q. What is a microchip implant for animals? A microchip implant for animals is a glass-encapsulated RFID microchip designed to be implanted into living flesh. The device consists of a Radio Frequency Identification or "RFID" integrated circuit (aka a microchip), a capacitor, and an antenna, sealed in a capsule of medical-grade glass. Since the early 1990's, implants have been marketed and sold for use in dogs, cats and other pets, horses, laboratory animals, livestock, and wild salmon. The implant is designed to remain permanently embedded under the skin of the animal. Q. What is the purpose of an animal implant and how does it work? 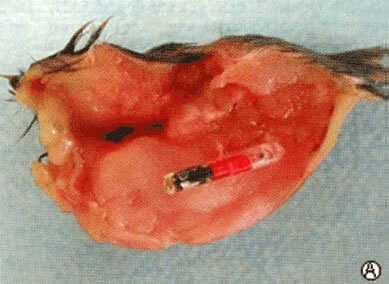 The implant is marketed as a way to identify animals. Here is how it works: a scanner is brought within range of the implant, the scanner emits a radio signal that stimulates the implant, causing it to emit its own radio signal in response. That signal is picked up by the scanner and converted into a unique identification number. This number is linked to an entry in a database of dogs and owners. Q. Can the microchip help locate a lost pet? Not in the way many people think. The microchip implant does not have GPS capability to locate a missing pet, nor does it use a satellite. The read range of a microchip implant is only 3 to 12 inches, so a scanner would have to be very close to an animal to read the implanted chip. A microchip implant can help recover a pet if and only if the pet ends up at an animal shelter or a vet's office. When shelter staff members find a stray animal, they first check to see if the animal is wearing a collar. If there is no collar, workers run an RFID reader over the animal's body to look for a microchip implant. If the pet has been chipped, the implant will emit a numerical code that can be looked up in a database to identify and contact the owner. Because the scanner must be brought very close to an animal in order to read its RFID implant, the implant would not help find a pet that has been lost in the woods or has got loose on a city street. Q. Have implanted microchips caused cancer in animals? Q. Where did the tumours form in the animals? In all cases, the cancerous tumours were located at the site of the microchip. The tumours either encased the microchip or were immediately adjacent to it. When scientists examined the tumours microscopically, they found that the tumours originated in the capsule of tissue that formed around the microchips. "All tumors were observed...at or near the implantation site...[the tumors] were attached to the implant or partially or totally encased the implant." "The intact microchip was found completely embedded within the [malignant] mass." Numerous other studies reached the same conclusions. Q. How does the microchip implant cause cancer? (1) Foreign-Body Tumorigenesis: The presence of a foreign body under the skin may cause cellular changes that lead to cancer. (2) Post-Injection Sarcoma: Inflammation from the chip-injection procedure may give rise to cancer. (3) Possible Genotoxic Properties of the Implant: The microchip may have carcinogenic properties or cause the body to produce carcinogenic byproducts. (4) Radio-Frequency Energy Emissions from the Transponder or Reader: The radio-frequency energy involved with the device may contribute to tumour formation. Each of these hypotheses is addressed in greater detail in our comprehensive report on the research titled "Microchip-Induced Tumors in Laboratory Rodents and Dogs: A Review of the Literature 1990.2006. "(Click here to read full review). However, we currently don't know which, if any, of these hypotheses is correct. Q. I'd like to examine the evidence myself. Where can I find the original research studies? The studies were originally published in a variety of pathology, veterinary and toxicology journals between 1996 and 2006. Katherine Albrecht, Ed.D., has authored a comprehensive, 52-page report titled 'Microchip-Induced Tumors in Laboratory Rodents and Dogs: A Review of the Literature 1990-2006'. Click here to read the full report.